This 34,903 square foot building at 1202 N Howard Avenue was constructed in 1904 after George and Lettie Benjamin deeded four parcels of land to Samuel I. Davis for $16,600. The Samuel I. Davis & Co. was its first occupant until 1911 when the Balbin Brothers purchased it. The Balbin brothers were Spanish immigrants from Asturias; Gabriel (1847-1913), Benigno (1852-1926) and Miguel (1853-1920), sons on Joseph Balbin and Vicenta Espina. They emmigrated to Cuba and arrived in New York between 1874-1877 and received citizenship in the late 1880s. 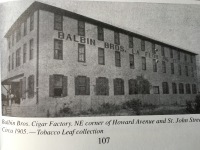 The Balbin Bros. Cigar Co., manufacturers of the popular Elizardo and Balbin Brothers brands, started on Franklin Street from where they moved in 1904 to a factory building on the corner of Albany & St. John, formerly occupied by A. Santaella whose picture below is a reproduction of a photograph in the Ciudad de Cigars: West Tampa book by Armando Mendez. This factory was burned on October 2, 1910 during a workers strike. After Samuel I. Davis & Co. moved out of this building, Balbin Bros. acquired it and moved here in 1911. Because one of the brands produced by Balbin Bros. was Elisardo, the building is sometimes referred to as the Elisardo factory building. On January 6, 1916 the Tampa-Cuba Cigar Co. located at Armenia and Cherry St. and incorporated on September 28, 1891 by businessmen from the Wholesale Druggist Association of America H.B. Guilford, Ernest Berger and Cuban cigarman Emilio Pons (1857-1914), acquired the Balbin Bros. Co. and its subsidiary the Diaz-Havana Cigar Co. which they had acquired shortly after it moved to West Tampa from Havana in 1912. As a result, Tampa-Cuba Cigar Co. became the largest cigar manufacturer in West Tampa. The company remodeled and expanded the factory building and made significant changes to its exterior. In December 1923 Balbin Bros. Co. and Diaz-Havana Cigar Co. were dissolved and Tampa-Cuba Cigar Co. continued operations at this site until it closed down on May 16, 1934. Between 1929-1933 the building was co-occupied by Gradiaz, Annis Co. before relocating to the Gradiaz, Annis Co. building in Ybor City. Throughought the years, Tampa-Cuba Cigar Co. shared the building with Tampa Grande Cigar Company, Elmerbrink Company and Preston Cigar Company. The name Diaz Havana Co., can still be seen on the side of the building. Between 1934 and 1936, the DeSoto Brewing Company owned the building and brewed beer in it. Between 1937 and 1975, Fred and Mack Perlman of Davis Island owned the building and used it for their enterprises which included the Empire Mercantile Company, Supreme Manufacturing Company, Sunstate Slacks, Inc. and Fremac’s - a chain of 24 men’s and boys’ clothing stores. Between 1978 and 2005 members of the Freeman family purchased the builidng and used if for their enterprises which included EverWear Products, Inc., Royal Kitchens, Inc., and Daystar International. In June 2005, Karyn and Glenn Freeman sold the building to North Hyde Park Lofts, LLC of Concord, Mass. In January, 2006 Intelident Solutions purchased the building for future use as its corporate headquarters. The building is currently (2015) abandoned.